Over the past few years, we’ve seen Intel and ARM both take steps towards each other’s core business interests. To date, both companies have met with limited success. Intel’s push into mobile resulted in some decent products but little sales momentum, while various ARM licensees are still working on server-class designs to compete with Intel’s Xeon and Atom-powered products. 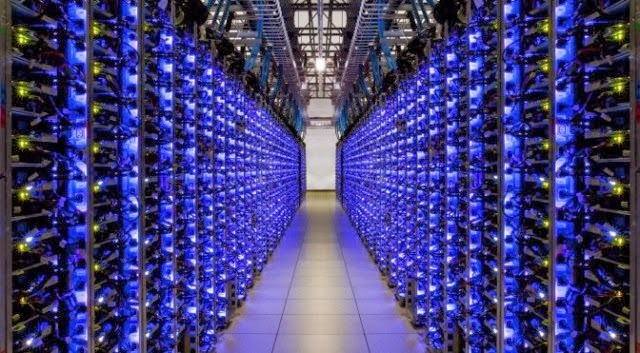 According to Bloomberg, Google is considering building its own ARM-based servers, in a move that could open a serious crack in Intel’s data center business. The danger here isn’t financial it’s structural and political. Even if Google decided it wanted to start rolling out its own ARM chips, it takes time to build a CPU from scratch (or to pay a foundry to fab an ARM standard core to your specifications). Even once you’ve got the core in-hand, the process of migrating over servers and shifting infrastructure is a long, slow job. Server rooms are not generally places of enthusiastic excess and Google would have to migrate a great deal of highly sophisticated software. It’s absolutely doable but it’s not the kind of thing Google would do on a lark, and it’s not a decision that would bite into Intel’s Q4 revenue. 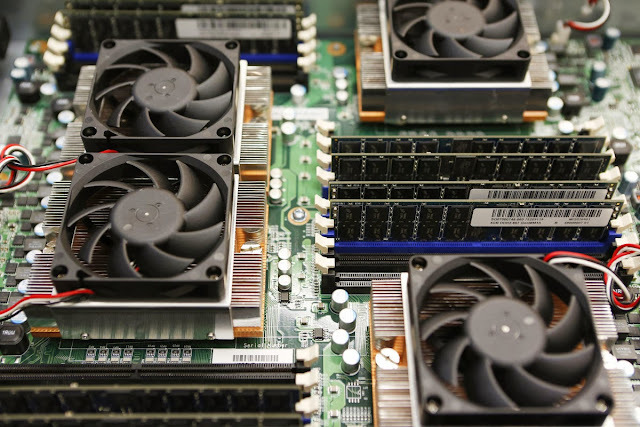 The question of whether a Google ARM project threatens Intel’s business is a complicated one. Pundits who confidently predict the death of x86 due to the same inexorable trends that drove x86 to ascendency into server rooms in the mid 1990s are likely overreaching. When Intel rose to dominate the server market in the 1990s, it wasn’t just because it built cheap processors, but because the Pentium Pro was capable of matching the performance of high-end RISC workstations. Initially shaky software support firmed up over the years as Intel continued to iterate on its own product designs, improved high end chipset capabilities, and invested in its own x86 compilers and software products. Critically, Intel didn’t face one unified opponent. IBM had products based on both Power and later, PowerPC. SGI owned MIPS, Sun had Sparc and UltraSparc, HP used PA-RISC, and Digital built Alpha. These chips were built according to RISC principles, but they weren’t cross compatible. If there had been one unified RISC vendor facing down Intel in the early 1990s, the market might have evolved in an entirely different direction. 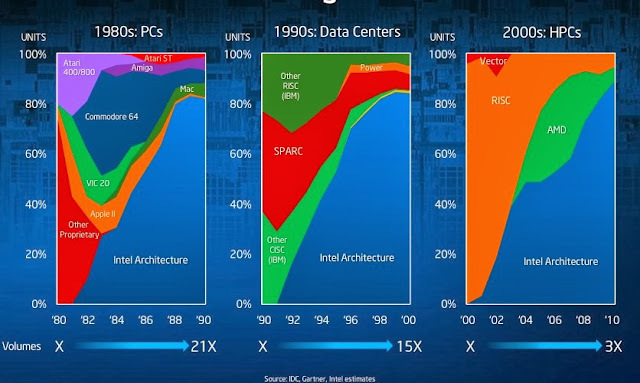 Intel was able to out-innovate its RISC competitors by offering superior integration and better performance. Could ARM vendors beat out Intel on that front? Maybe but to date, they haven’t. Intel is a prominent member of Facebook’s Open Compute Project. It’s partnered up with HP to build server cards, just as it pushed into blade servers years ago. The entire Atom product line has prominently transitioned into the server space over the past few years, just as the rumors of ARM servers began to coalesce into real products. ARM servers from the likes of Calxeda, X-Gene, or or even AMD’s own efforts could grab notable market share, but don’t necessarily threaten the x86 architecture’s dominance of the overall market. A Google-designed chip would be a different matter. Even if the impact to Intel’s balance sheet were small, the impact on the idea of an x86 hegemony could be significant. It’s the sort of rumor that leads to phone calls and high level conversations between executives and possibly more custom designs for Google’s own data centers. A VDR is a central server containing the relevant documents, with an extranet connection: a highly secure internet connection with limited access from the outside world. Thx for sharing, it's very useful information.